North Korea has defended plans for a large-scale military parade scheduled for the day before the Winter Olympics in South Korea. Pyongyang's annual military parade to mark the founding of its armed forces has taken place in April for 40 years. From 2018, however, it has been changed to 8 February - when athletes will gather in Pyeongchang for the opening ceremony the following day. North Korea said that no-one had the right to take issue with its plans. A column in the ruling Workers' Party newspaper - the Rodong Sinmun - dismissed views that the event was provocative. Instead, the newspaper said, it is "basic common sense that any country in the world takes the founding anniversary of its military very seriously and celebrates it". Pyongyang previously held its main military celebration on 25 April. The 2018 celebration, however, will mark the 70th anniversary of the foundation of the Korean People's Army, which was established on 8 February 1948. But professor Robert Kelly of Busan University in Seoul said Pyongyang's decision to hold the parade at such a time was politically motivated. "It's going to be gigantic, it's a day before the Olympics - that kind of sends a signal," he said. "Even though South Korea can have all these foreigners come to its country, this big peaceful exciting event with all this global attention - you know everybody still has to pay attention" to the North. Monitoring group 38 North, however, said that while satellite imagery showed "at least 12,000 troops" gathered at a parade training facility, current evidence suggested February's event "will remain relatively smaller in scale" than previous parades. Tensions on the Korean peninsula remained extremely high throughout 2017, as North Korea completed a series of nuclear tests and missile launches designed to demonstrate its nuclear capability. 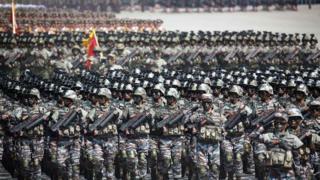 North Korea's military parades usually feature thousands of troops and a display of missiles or other military hardware. At time when thousands of foreign athletes, officials, and spectators have gathered just 300km (185 miles) to the south, the planned event has been met with trepidation. US Under Secretary of State Steve Goldstein told a press briefing earlier this week: "We would prefer that this parade not occur". "The Olympic Games are about the athletes and nothing should be occurring which interfere with that," he added. But he downplayed security concerns, saying South Korea was doing "a phenomenal job" in its preparation. What's been happening around the Winter Olympics? Concerns about security at the Winter Olympics eased in January, when North Korean leader Kim Jong-un appeared to extend an olive branch in his new year's speech. Since then, the Pyeongchang games have been the subject of sudden co-operation between the two Koreas. The two countries have dramatically improved ties in just a few weeks, reopening lines of communication and negotiating a joint presence at the games. They will march under a unified banner, and field a joint women's ice hockey team. Now, there are hopes that the progress made could lead to wider political solutions. In January, South Korea's foreign minister said she would continue high-level talks with "clear eyes" - and that despite concerns over North Korea's motives, "we have to make the most of it." On Saturday, North Korea's state news agency KCNA criticised suggestions that the parade could be viewed as threatening. Such an interpretation would "only bring about the consequences of souring the successful opening of the Winter Olympics", it said.